I am not a neurologist. I am not a vet. I am not giving medical advice and this post should NOT be taken as such. My purpose in writing this post is to share what I have learned in the five months since Wobbler Syndrome invaded my life. Much of this information is based on my own research, discussions with my neurologist as well as the process that took my boy from chronic neck pain to a Wobbler’s diagnosis. If you have not yet read the beginning of our story, you can do that here: Wobbler Syndrome -The Most Painful Intersection Between Diet and Genetics. Above all, If you suspect your dog may have Wobbler Syndrome, please seek veterinary medical care as soon as possible. Early intervention can absolutely help and a proper diagnosis (**see below for what that means) is a critical first step. I’m going to do my best to break this down into layman’s terms. Essentially cervical spondylomyelopathy refers to a disease of the neck vertebrae affecting the spinal cord. You may also see Wobbler Syndrome (also called Wobbers Disease) called cervical vertebral instability (CVI), cervical vertebral malformation (CVM). cervical vertebral malformation-malarticulation (CVMM), and cervical spondylopathy. These terms are all used interchangeably and refer to the same disease. There are two main forms of Wobbler Syndrome. In other words, his bone is growing too fast (osseous proliferation) at the C4-5 and C5-6 vertebrae (internal facets are the inside area of the bone where the spinal cord is) and is causing compression of his spinal cord in that area (vertebral canal stenosis). This form of Wobblers is also called cervical stenotic myelopathy. This form occurs most often young, giant-breed dogs such as Great Danes, Mastiffs, and Bernese Mountain Dogs. Symptoms of the disease in these dogs typically show up at a young age (a few months to a couple years) and progressively get worse over time. The second form is often referred to as disc-associated Wobblers. This form occurs in middle- to older aged dogs and is usually caused by a chronic bulging intervertebral disc, which slowly puts pressure on the base of the spinal cord. This form of wobbler syndrome is commonly seen in large-breed dogs, such as the Doberman Pinscher, Labrador Retriever, and Dalmatian. Wobbler Syndrome is a disease of large and giant breed dogs primarily. While there are cases in smaller dogs, they are uncommon. The most commonly affected breeds are Doberman pinchers (5.5%), Great Danes (4.2%), and Mastiffs, however any large or giant breed dog can be affected. Dobermans are usually diagnosed with disc-associated Wobblers later in life. The mean age for diagnosis in Dobermans is 6 years. 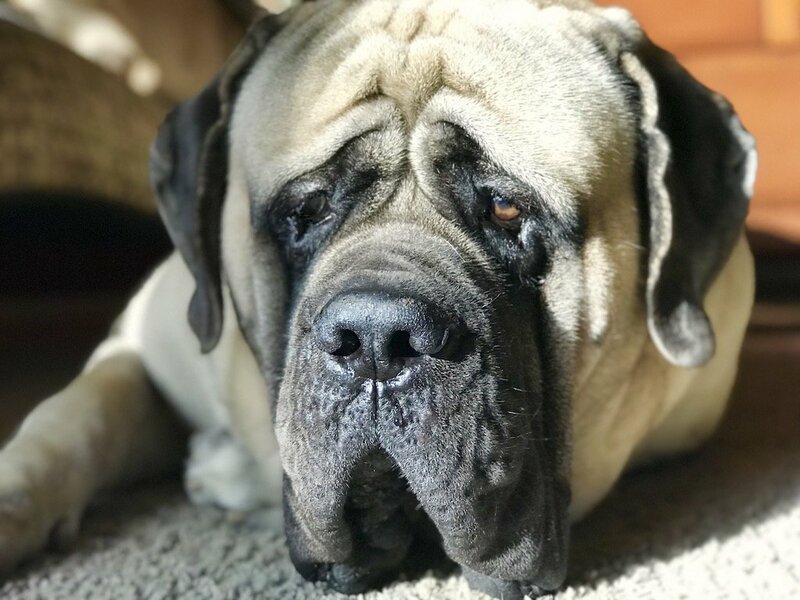 Giant breed dogs like Great Danes and Mastiffs are most commonly diagnosed with the vertebral malformation (bony associated compression) form early in life, from 6 months to 3 years. Other breeds that are affected are Rottweilers, Weimaraners, Irish Wolfhounds, German Shepherds, Bernese Mountain dogs, Greater Swiss Mountain dogs. and any other large or giant breed dogs. While there is no consensus to date, genetics are believed to be the most likely cause of the disease. In other words, the genes responsible for causing the disease are passed from one generation to another through breeding. In very rare cases, injury to the neck has been also been reported as a possible cause. This is NOT a common cause of the disease and should NOT be used to pass blame onto owners with Wobblers dogs. Current research at OSU is investigating the genetics of the disease in Dobermans with plans to study it in Great Danes in the future. Clinical signs are usually slow and gradual in onset with Wobblers disease, but can appear to suddenly get worse if they have trauma to the spinal cord during exercise or have a second spinal cord problem, such as a sudden disc herniation. Most commonly, these dogs will have a “wobbly” gait mostly in the back end (thus the name “wobblers”). It will appear as a lack of coordination, walking with a wide stance, swaying from side to side, and taking longer strides. This wobbly gait may only be visible in slippery floors and when the dog walks slowly. Forelimb involvement can vary greatly depending on the abnormality and severity of the disease. Some dogs have no clinical symptoms in the front limbs, while others have a stiff short-strided, choppy, or floating front limb gait. Some dogs have difficulty turning around and cross their front limbs over each other when turning. Some Wobblers dogs may present with neck symptoms like Junior. These dogs walk with their head down, and are reluctant to bend their necks down or turn their necks from side to side. All of this is a clear indication of neck pain. In the more advanced stages of the disease the problems become obvious in all four legs, and they may have trouble getting up, appear very weak, and even “buckle over” with the front legs. Approximately 5% of dogs with wobblers may become acutely paralyzed in all four legs. As I stated in the beginning of this post, if your dog is showing any of the symptoms I just outlined, you need to see your Veterinarian. I will share briefly some of the tests your vet may recommend if he or she suspects Wobblers, but before I get there, I wanted to share a few of the physical tests you can do at home to check your dog’s neurological function. These were tests my neurologist did with Junior when we went in for his MRI. VISUAL ASSESSMENT: A wobbly gait would suggest a neurological issue, whereas weakness could be more musculoskeletal. POSTURAL REACTION ASSESSMENT: When turned over, paws should right themselves automatically if neurological function is normal. This is also called paw replacement, propioception, or postural relex. A delay in flipping the paw upright might suggest a neurological deficit. HOPPING ASSESSMENT: Poor initiation of the hopping reaction suggests sensory (proprioceptive) deficits; poor follow-through suggests a motor system abnormality (paresis). RANGE OF MOTION OF NECK: You will want to test range of motion down to the chest and side to side. Stiffness or lack of ability to fully flex neck can be an indication of neck pain. Here is a short video showing what a full range of neck motion looks like for a dog’s neck. Here is a full video of me showing how to do these tests so you can easily do them at home. This second video is a Facebook Live session with my Big Dog Mom Community. If you are not yet a member, join here. X-rays are usually recommended first to see if they can identify any obvious bony lesion or diagnose other diseases that can mimic wobbler syndrome. However, while plain x-rays of the skull and spine can detect fractures, infections, or bone cancer, in most infections or cancers of the brain and spinal cord, plain x‑rays appear normal. For reference, Junior didn’t have x-rays taken until the day we went in for our MRI. Blood tests may also be ordered to detect metabolic disorders, some of which can affect nervous system activity. Blood tests can also identify other conditions, including lead poisoning, certain infections, and myasthenia gravis, an autoimmune disease in which the connections between nerve and muscle are blocked and weakness results. For an official confirmed diagnosis of Wobbler Syndrome, more advanced imaging tests are required. The best test is an MRI (magnetic resonance imaging) and that is what we got for Junior. also help evaluate changes in bone structure, internal bleeding, abscesses, inflammation, and certain nervous system cancers as well as confirm a diagnosis of Wobblers. Here are a few images from Junior’s MRI that illustrate the difference between what is a normal amount of cerebrospinal fluid (CSF) (the white) around the spinal cord and where the bone is now compressing his spinal cord. Dogs can be treated medically or surgically and the recommendation by your neurologist will depend on many factors including age, severity of disease, type of compression, and the number of vertebrae affected. Medical management typically involves activity restriction and treatment with anti-inflammatories and/or corticosteroids to reduce spinal cord swelling associated with compression. Medical management alone is often recommended in dogs with mild clinical signs or dogs with spinal cord compression in multiple locations (more than three to four vertebrae) that might not be good surgical candidates. Since Junior’s symptoms were primarily in his neck, he was also prescribed Gabapentin for neuropathic pain. Additionally, traditional collars or halti – type harnesses are not recommended for dogs with Wobblers. The use of a chest harness is strongly recommended to ensure no pressure is applied to the neck. If surgery is an option, there are over 21 different types used to treat Wobbler Syndrome. The goal of surgery is to stop the progression of clinical signs. Because the spinal cord compression has been occurring over a long period of time, there is typically permanent spinal cord damage. Most dogs never walk normally even with surgery, however, many will improve to be able to have a good quality of life. Since Junior’s diagnosis, I have been on a mission to find alternatives to chronic medications for him. While I am not at all opposed to using medications where necessary and am absolutely committed to keeping him comfortable and pain-free, I believe there are some great natural supplements that can absolutely make a difference for him. I have been attacking this disease from two sides as it relates to supplements; boosting immune function and anti-inflammatory effect. Rather than going into great detail here, I will refer you to a few articles I wrote about these supplements. Please let me know in the comments below if you would like more information on any one of these. Natural Pain Relief for Dogs: 5 Supplements You MUST Try! Unfortunately, because we do not have a definitive answer on what causes Wobbler Syndrome, we don’t have a clear picture on how to prevent it either. That said, I do believe there are steps each of us big dog owners can take to reduce the prevalence of this silent, progressive killer. As stated above, the following are my opinion and should not be taken as scientific fact. They are merely one Wobbler mom’s recommendations based on her knowledge and personal experience. Do not breed dogs that have been diagnosed or are suspected to have Wobbler Syndrome. Do not breed parents or siblings of dogs with Wobbler Syndrome. Ok, I know breeders are screaming at me right now, so let me explain this one. While researchers are still trying to determine the exact cause of Wobbler Syndrome, it is undeniable that the prevalence is highest within certain breeds and pedigrees of dogs. Studies are being done on Dobermans and Great Danes, and hopefully soon, Mastiffs, the breeds with the highest rates of disease, with the goal of finding a genetic marker. Short of a genetic marker, we can only speculate when it comes to breeding decisions. Why breed dogs who are related or who have produced Wobblers when there are so many others to choose from who haven’t? Why knowingly impose this disease on the hearts of future puppy buyers, who may not be prepared for the years of medications, tests and heartbreak that lie ahead for them. Until we have a genetic marker, you are taking a risk. One that I do NOT believe is worth it. Parents and siblings of Wobblers dogs should not be bred. Period. This one is controversial, especially for me. I won’t go into detail about Junior’s raw diet here. I did that in Wobbler Syndrome -The Most Painful Intersection Between Diet and Genetics. What I will say is that feeding a large or giant breed puppy is a science in and of itself. Most giant breed puppy owners will go through two years of self-doubt, confusion, and uncertainty about what they are feeding, constantly searching for perfection that doesn’t exist. That said, here are a couple simple rules to follow as you are raising your large or giant breed puppy. While there is no documented evidence that diet causes Wobblers, it is prudent for all large and giant breed dog owners to watch the weight and caloric intake of their dogs while they are growing. Keep your dog lean and don’t overfeed. Too many calories have been linked to other growth disorders in large and giant breed dogs; panosteitis, OCD, etc. Pay attention to the ratio of calcium to phosphorus in the food you are feeding. Excess calcium and phosphorus has been linked to other growth disorders in large and giant breed dogs. You want the ratio of calcium to phosphorus to be close to 1:1. Your Dog Is Diagnosed With Wobbler Syndrome, Now What? The prognosis for a dog with wobbler disease depends greatly on the severity of the malformation and the amount spinal cord compression. Dogs that are severely affected to the extent that they are unable to stand or walk have a guarded prognosis even with surgical intervention. Here’s the truth to the question, now what. Life changes. A walk around the neighborhood changes. Freedom to climb the stairs in your house changes. Look, I’m not going to sugar coat this and tell you it’s no big deal. It’s a huge deal and it will change your life. I have heard some suggest that Wobblers isn’t a disease. That it is an outcome of some outside force (diet, injury). While none of us knows the exact cause of Wobblers, it is clear to me that those who deny or reject the obvious genetic component of this silent, progressive killer are those who are attempting to pass the buck. Breeders quick to blame their puppy owners for not feeding the right food or injuring the puppy’s neck with a collar. Breeders who conceal evidence of Wobblers in their lines to avoid a tarnished public image. And breeders who deny responsibility and continue to breed affected dogs, siblings, and offspring. Wobbler Syndrome IS a neurologic disease of large and giant breed dogs. We may not have a genetic marker (yet), but we do have common sense. Let’s make selfless and conservative breeding decisions to stop the spread of Wobblers. We may find that there are other contributors, but until we know for sure, let’s not take the chance. Share this information with a big dog lovin’ friend. Early detection is critical and that only happens if dog owners know what to look for. Please ask your neuro surgeon about Pentoxifylline. My female Dobbie was FULLY paralyzed and went on 400mg extended release 3 times daily and started walking again after about a month and was back to baseline at 6 weeks with no prednisone. It was a lifesaver for us. She has continued on this therapy for 2.5yrs. We too need surgery but so far this is allowing her to maintain without medication side effects. I don’t know why more physicians don’t prescribe this. It was prescribed by her neuro surgeon. The medication restores/improves blood flow to the spinal cord which helps with mobility and subsequently pain since it restores the constricted area of the spinal canal which leads to pain. Oh my gosh, that’s wonderful news, Katherine! We are basically medically managing right now and fortunately surgery is not an option for Junior at this point. I’ve never heard of the drug you mentioned. I will definitely look into it. Thank you so much for posting this!! !